Objective: To investigate the best criteria for discriminating fetuses with isolated posterior urethral valves from those theoretically not eligible for fetal treatment because of complex megacystis, high chance of spontaneous resolution, and urethral atresia. 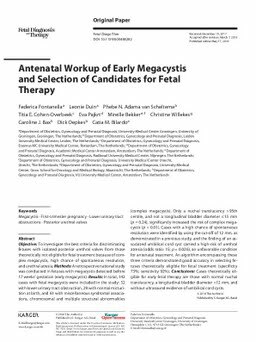 Methods: A retrospective national study was conducted in fetuses with megacystis detected before 17 weeks’ gestation (early megacystis). Results: In total, 142 cases with fetal megacystis were included in the study: 52 with lower urinary tract obstruction, 29 with normal micturition at birth, and 61 with miscellaneous syndromal associations, chromosomal and multiple structural abnormalities (complex megacystis). Only a nuchal translucency > 95th centile, and not a longitudinal bladder diameter ≤15 mm (p = 0.24), significantly increased the risk of complex megacystis (p < 0.01). Cases with a high chance of spontaneous resolution were identified by using the cut-off of 12 mm, as demonstrated in a previous study, and the finding of an associated umbilical cord cyst carried a high-risk of urethral atresia (odds ratio: 15; p = 0.026), an unfavorable condition for antenatal treatment. An algorithm encompassing these three criteria demonstrated good accuracy in selecting fetuses theoretically eligible for fetal treatment (specificity 73%; sensitivity 92%). Conclusions: Cases theoretically eligible for early fetal therapy are those with normal nuchal translucency, a longitudinal bladder diameter > 12 mm, and without ultrasound evidence of umbilical cord cysts.